Tony Mandarich is a true story about the rise, fall, and return, of an incredible offensive lineman from one of the best drafts during the ‘golden era’ of football. The 1989 draft is considered by many, (myself included,) to be one of the greatest professional football drafts of the modern age of football. The draft included some huge names. Troy Aikman, Derrick Thomas, Barry Sanders, Deion Sanders,Eric Metcalf, Steve Atwater, and Andre Rison were all some of the big names taken- and that was during the first round. Of these names mentioned, Aikman, Thomas, and both Sanders are in the Hall of Fame. They went number one overall, number three, number four, and number five. So wait a minute, who went number two? 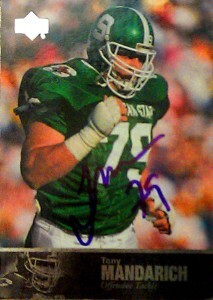 Enter “The Incredible Bulk”, Tony Mandarich. 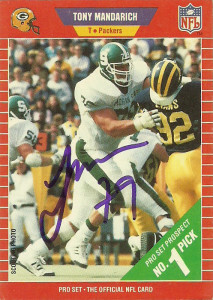 Tony Mandarich had an impressive career at Michigan State after coming to the states from Canada during High School. A veritable man-mountain, Tony measured in at 6’6″, 304 and ran the 40 in a mouth watering 4.65. For an offensive lineman of his size and power, the numbers were not only off the chart, – they were unheard of. 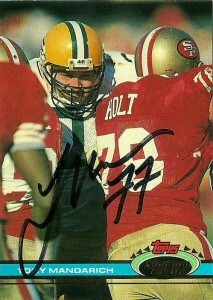 He even popularized the term ‘knockdown block’ for offensive linemen, averaging 10 or more a game. Mandarich’s stock skyrocketed prior to the NFL draft. I remember one of the first Sports Illustrated’s that I got in the mail featured Tony on the cover, (in a not so flattering photo, but showcasing his frame,) touting him as “The Incredible Bulk” on the cover of the magazine. It was a lot to live up to for Mandarich, so he embraced the hype machine. 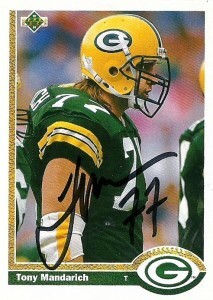 Tony went #2 to the Green Bay Packers, after the Cowboys selected Troy Aikman #1 overall. Most draft pundits at the time believed the old wives tale that: “Offensive line was the safest position to pick high in the draft,” and showered Coach Lindy Infante and the Pack with praise for their conservative and solid pick. Mel Kiper was so high on Tony, I thought he was going to name his first born after him. 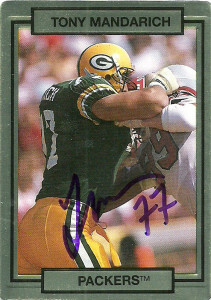 Mandarich came into Green Bay with a head of steam and proceeded to spiral out of control due to drugs and alcohol abuse. He also went from ‘bad boy’ in the media darling spotlight, to just ‘bad’ in the media spotlight. It was a quick and public fall for Tony who was lambasted for not even cracking the starting lineup in 1989. In 1990 he started all 16 games at right tackle, (but was penalized more often than any other lineman on the team,) and quietly started 15 more in 1991. Things only got worse for Tony however, as he sat out all of the 1992 season due to a thyroid condition and post-concussive syndrome symptoms. After shopping him privately throughout the year to multiple teams, the Packers decided to cut Mandarich citing a non-football injury. “Sports Illustrated” basically said, “Don’t let the door hit you on the way out,” with their cover follow up article “The NFL’s Incredible Bust”. It was a hard, hard fall for Tony and he remained out of football for the next 4 seasons, fighting his inner demons and getting treatment for drugs and alcohol, but in 1996 there he was again, reborn- in Indianapolis. The Colts needed help in 1996 going through another ‘rebuilding phase’ before the ‘Age of Manning’, and the place they needed it most was o-line, where they were thin at the position and wet behind the ears. Everybody loves a comeback story, but nobody really likes to be proven wrong, especially after they’ve dead and buried a guy, so there were very few people who gave Mandarich a chance at redemption, but the Colts and his former Coach Lindy Infante did, and he’d reward them by putting in a solid, humble, workmanlike job. Tony was an experiment to the Colts that paid off, listed at a right tackle, but also spending a lot of time inside at guard. (He lost out on the NFL Comeback Player of the Year Award to Jerome Bettis.) Tony, in fact started all 16 games in 1997, and was on his way to starting all 16 in 1998, but a shoulder injury in week 10 ended his season. Mandarich finally decided that he was done, and opted to retire after the season. book titled, “My Dirty Little Secrets: Steroids, Alcohol, & God”, and also did a ‘Behind the Lines’ story for ESPN, but really he hopes to just be able to show other people that there is indeed redemption and a way out and back at the end of the day. Tony currently runs a photo studio that specializes in nature photography and a full service web media business specializing in website development and optimization. He also does motivational public speaking about his life and struggles. Tony has been really good to fans over the years and is an avid TTM signer. While I had gotten the Upper Deck and Stadium Cards previously through the Canton Acquisition, but I really wanted to get Tony on cards that were important to me. I was happy to get him on the GameDay, ProSet, Action Packed, and Upper Deck Legends cards in under half a month.